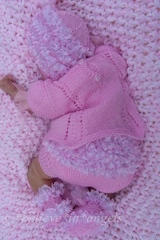 #KSB..99 KNITTING PATTERN KSB 99..... SWEETNESS AND LIGHT, ROMPER AND CARDIGAN SET IN 4 SIZES. THIS IS A PDF FILE THAT WILL BE SENT TO YOU BY E MAIL ONLY. IT CAN BE PRINTED AND POSTED TO YOU, BUT IN ORDER FOR YOU NOT TO BE OVERCHARGED ON POSTAGE IF YOU WANT MORE THAN ONE, PLEASE WILL YOU MESSAGE ME AND I WILL GIVE YOU A TOTAL COST FOR PATTERNS, PRINT AND POSTAGE. THIS IS THE KNITTING PATTERN FOR SWEETNESS AND LIGHT, WHICH IS A 4 PIECE SET IN 4 SIZES. 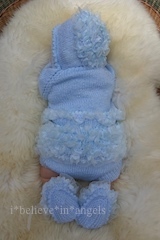 THE SET IS CARDIGAN, ROMPERS, HAT AND BOOTIES AND WILL FIT BABIES FROM SMALL NEW BABY TO ABOUT A YEAR OLD. 14 - 16 - 18 - 20 INCH CHEST. 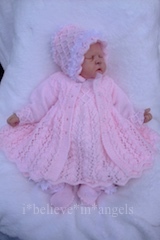 IT WILL ALSO SUIT REBORN DOLLS. ITS A PRETTY STRIPED SET, WITH THE OPTIONAL ADDITION OF EARS AND A HEART NOSE TO MAKE IT SUPER CUTE. THE SET AS SHOWN IS MADE IN UK DOUBLE KNITTING YARN, CAN BE MADE IN 4PLY TO MAKE IT SMALLER OR ARAN TO MAKE IT BIGGER. ALL THE PATTERN IS IN ROW COUNTS SO NO ADJUSTMENT IS NEEDED. RELATIVELY SIMPLE TO KNIT SO WILL SUIT ANYONE WITH BASIC KNITTING SKILLS WISHING TO LEARN A FEW MORE TECHNIQUES. ALL DETAILS GIVEN. #KSB..98 KNITTING PATTERN..KSB 98. TO MAKE WINTER JASMINE. Matinee coat, dress, rompers, hat and booties in 3 sizes. 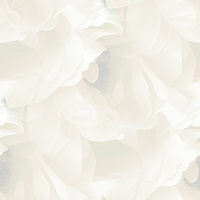 THIS PATTERN WILL BE SENT TO YOU BY E MAIL ONLY. IF YOU WISH IT TO BE PRINTED AND POSTED PLEASE CONTACT ME TO ARRANGE THE DETAILS, POSTAGE AND PRINTING CHARGES WILL APPLY. THEY ARE NOT ADDED HERE SO THAT YOU DON'T GET OVERCHARGED ON POSTAGE WHEN BUYING MORE THAN ONE. 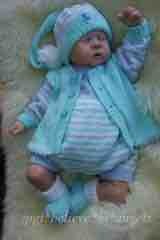 THIS IS WINTER JASMINE, A SET COMPRISING OF A MATINEE COAT, A DRESS A PAIR OF ROMPERS, MATCHING HAT AND BOOTIES. ALL PATTERNED WITH A SIMPLE 6 ROW LACE PATTERN AND WITH A SMOCKED TOP AND DETAILS. IT LOOKS VERY COMPLEX BUT IN FACT THE PATTERNS ARE QUITE SIMPLE AFTER YOU HAVE GOT THEM SET, SO I WOULD ENCOURAGE A DETERMINED NOVICE TO HAVE A GO, AS ALL OF THE DETAILS ARE THERE FOR YOU. THE SETS ARE IN 3 SIZES 14 - 16 - 18 INCH CHEST, TO FIT A SMALL NEW BABY TO 6 MONTHS. THESE SETS WERE KNITTED IN UK DOUBLE KNITTING, BUT AS ALL THE INSTRUCTIONS ARE IN ROW COUNTS, THEY COULD BE DONE IN 4 PLY AND THEY WILL COME OUT SLIGHTLY SMALLER. NO CHANGES WILL BE NECESSARY.  THIS IS A PDF FILE WHICH WILL BE SENT BY E MAIL. YOU MAY ALSO REQUEST THAT IT IS POSTED OUT AND THERE WILL BE AN EXTRA CHARGE TO COVER PRINTING AND POSTAGE, PLEASE MESSAGE ME TO ARRANGE THIS. LAMBKIN'S IS A 4 PIECE SET CONSISTING OF A PAIR OF STRIPED LEGGINGS, A COAT WITH STRIPED SLEEVES, A HELMET WITH LONG EAR FLAPS AND MATCHING BOOTIES. 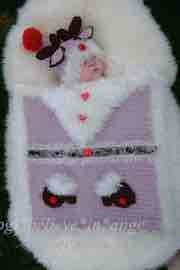 THERE IS ALSO A LAMBKINS COMFORTER. ALL MADE IN DOUBLE KNITTING YARN AND ON STRAIGHT NEEDLES, TO FIT 14 - 16 - 18 INCH CHEST (SMALL NEW BABY TO 6 MONTHS APPROX). BUT CAN ALSO BE KNITTED IN 4PLY OR ARAN WEIGHT YARN, ALL DETAILS GIVEN. MODERATE AMOUNT OF KNITTING KNOWLEDGE REQUIRED BUT LOTS OF DETAILS AND PICTURES GIVEN TO SUIT AN AMBITIOUS AMATEUR. LOVELY TO MAKE. I REALLY ENJOYED THIS ONE. 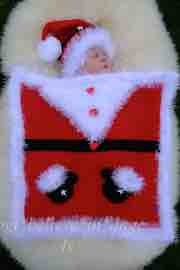 #KSB..96 KNITTING PATTERN KSB..96 TO MAKE THAT'S CHRISTMAS COVERED! THIS IS A PDF FILE WHICH WILL BE SENT BY E MAIL ONLY. IF YOU WANT IT PRINTED AND POSTED IT CAN BE DONE AND THERE WILL BE AN EXTRA CHARGE TO COVER THE COSTS, PLEASE CONTACT ME TO MAKE ARRANGEMENTS. 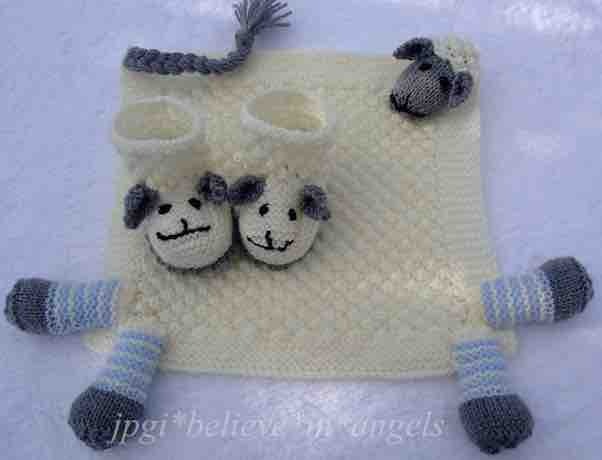 THIS IS THE KNITTING PATTERN TO MAKE THESE DELIGHTFUL COVER AND HAT SETS. DESIGNED FOR WINTER/CHRISTMAS, IT'S A SMALL COMFORTER SIZED COVER, WHICH WILL NICELY COVER A SMALL BABY IN A CAR SEAT, MOSES BASKET ETC ETC, OR DELIGHT A SMALL GIRL WITH A DOLL'S PRAM. THE HATS ARE IN 4 SIZES, FROM SMALL BABY TO 12 MONTHS. THERE ARE 4 MAIN OPTIONS FOR THE COVERS TOO. ALL TO BE MADE IN DOUBLE KNITTING WEIGHT YARN AND A FUR YARN (EG. KING COLE TINSEL). ALL ON STRAIGHT NEEDLES. RELATIVELY SIMPLE WITH ONE OR TWO FIDDLY BITS. BUT ALL INSTRUCTIONS ARE THERE TO MAKE EVERYTHING, AND LOTS OF PICTURES TOO. THIS IS A PDF FILE WICH WILL BE SENT BY E MAIL ONLY. IF YOU WANT IT PRINTED AND POSTED IT CAN BE DONE AND THERE WILL BE AN EXTRA CHARGE TO COVER THE COSTS, JUST CONTACT ME TO MAKE ARRANGEMENTS. I WANTED TO MAKE SOMETHING LOVELY FOR CHRISTMAS, AND I REALLY WANTED TO KNIT AN ANGEL, SO I STARTED KNITTING LACE AND FUR AND I ARRIVED AT GLORIANA. DELIGHTFULLY OPPULENT AND DEFINITELY OVER THE TOP, BUT ITS CHRISTMAS AND OVER THE TOP IS THE ORDER OF THE DAY. 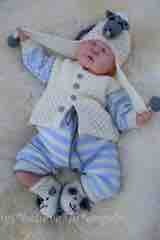 A 4 PIECE SET, CONSISTING OF A FULL SKIRTED COAT WITH A LACE YOKE, LACE PANTS, A MATCHING HAT AND BOOTIES. ALL TRIMMED WITH LACE AND FUR AS THE FANCY TAKES YOU. 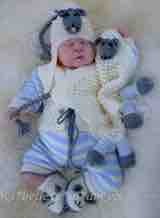 TO FIT SMALL NEW BORN, 0/3 AND 3/6 MONTHS, KNITTED IN DOUBLE KNIT, BUT AS ALWAYS COULD BE KNITTED IN 4 PLY. ALL ON STRAIGHT NEEDLES. MOST OF THE KNITTING IS VERY SIMPLE, WITH JUST A FEW BITS THAT NEED CONCENTRATION, SO TO SUIT ANYONE WILLING TO READ THE PATTERN WHICH IS VERY DETAILED. HAPPY KNITTING. 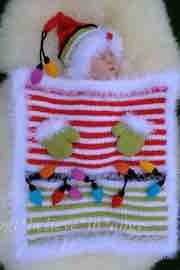 #KSB..94 KNITTING PATTERN KSB..94 TO MAKE JIG A JIG...ROMPERS, CARDIGAN, HAT AND BOOTIES. THIS IS A PDF FILE AND WILL BE SENT BY E MAIL UNLESS YOU REQUEST PRINT AND POST WHICH IS AVAILABLE AT EXTRA COST TO COVER. JIG A JIG IS A SWEET LITTLE OUTFIT CONSISTING OF A CARDIGAN, ROMPERS, HAT AND BOOTIES, ALL DESIGNED TO MAKE USE OF THE WONDERFUL ARRAY OF RANDOM AND MULTICOLOURED YARNS THAT ARE AVAILABLE NOW. THE CARDIGAN AND ROMPERS ARE KNITTED FROM THE NECK DOWN SO THAT THE PATTERNING WILL FORM A PRETTY YOKE. ITS A SIMPLE DESIGN, AND FAIRLY EASY TO KNIT, HOPEFULLY ONE YOU WILL WANT TO RETURN TO MANY TIMES AND HOPEFULLY ACHIEVE A TOTALLY DIFFERENT LOOK EVERY TIME. 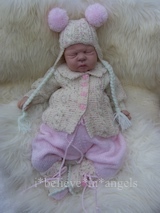 3 SIZES INCLUDED, SMALL BABY, 0/3 AND 3/6 MONTHS OF REBORN DOLL. AS ALWAYS KNITTED ON STRAIGHT NEEDLES, AND MADE IN DOUBLE KNIT, BUT CAN BE KNITTED IN FINER OR HEAVIER WEIGHT YARN TO MAKE THE SET SMALLER OR LARGER. ALL DETAILS GIVEN. THIS IS A PDF FILE AND WILL BE SENT BY E MAIL ONLY UNLESS YOU REQUEST POSTAGE AT EXTRA COST. IT HAS PICTURES THROUGHOUT. THIS IS A KNITTING PATTERN FOR A DAINTY MATINEE COAT, WITH MATCHING DRESS, BONNET AND A PAIR OF SHOES. IT IS A TRADITIONAL AND FAIRLY INTRICATE BOBBLE AND LACE DESIGN. IT IS VERY NICE TO MAKE (NO TURNING ON THE BOBBLES!) ALL ON STRAIGHT NEEDLES. TO SUIT AN EXPERIENCED KNITTER OR AN ENTHUSIASTIC AMATEUR WITH PATIENCE! ALL DETAILS INCLUDED AND PLENTY OF PICTURES TO HELP. 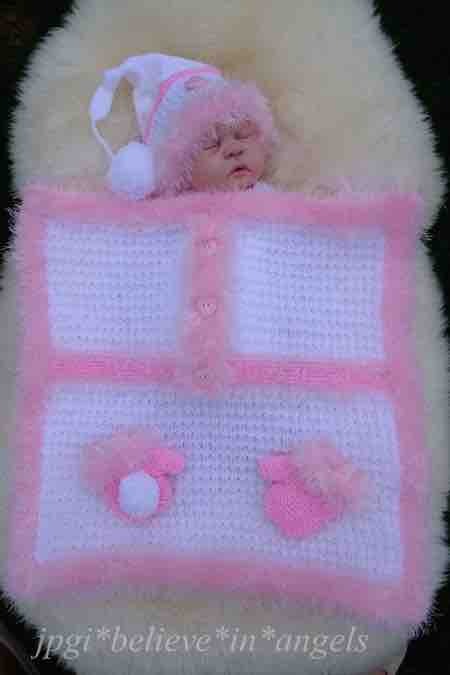 TO BE MADE IN DOUBLE KNITTING TO FIT 0/3 MONTH BABY OR REBORN DOLL. HOWEVER IT CAN BE MADE SMALLER BY MAKING IN 4PLY. (ALL DETAILS INCLUDED). THIS IS THE KNITTING PATTERN TO MAKE A LOVELY FRILLY LITTLE SET , BODY SUIT, SHRUG, BONNET AND SHOES WITH LASHINGS OF FRILLS AND SOME WITH AN ADDED RIBBON EDGE. (ALL EXPLAINED IN THE PATTERN) THE SET COMPLIMENTS LITTLE NIX AND IS INTERCHANGEABLE BUT IT IS VERY DIFFERENT. THE BANDS ARE KNITTED ON, SO NO AWKWARD PICKING UP STITCHES AROUND LEGS. HOWEVER IT CAN ALSO BE MADE IN 4 PLY AND IT WILL COME OUT A LITTLE SMALLER, ALL IN ROW COUNTS SO NO ADJUSTMENTS NEEDED. LOVELY TO KNIT, KNITTING LACE IN IS SO SIMPLE TOO. ON STRAIGHT NEEDLES. A MODERATE AMOUNT OF SKILL REQUIRED HOWEVER EVERY ROW IS GIVEN IN DETAIL. THIS IS THE KNITTING PATTERN TO MAKE A SELECTION OF LITTLE VESTS AND PANTS (NAPPY COVERS), HATS AND BOOTIES. 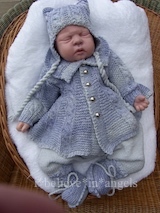 THERE ARE DESIGNS USING KNITTED IN LACE, OT KNITTED RUFFLES, ALSO SIMPLER DESIGNS WITH STRIPES FOR LITTLE BOYS. THE BANDS ARE KNITTED ON, SO NO AWKWARD PICKING UP STITCHES AROUND LEGS AND NECKS TOO. THERE IS A COAT WITH CABLE AND GARTER STITCH PANELS, AND ALSO A CARDIGAN. PLAIN TROUSERS, AND A CABLE HAT WITH EAR PIECES, AND MATCHING FULL BOOTIES. 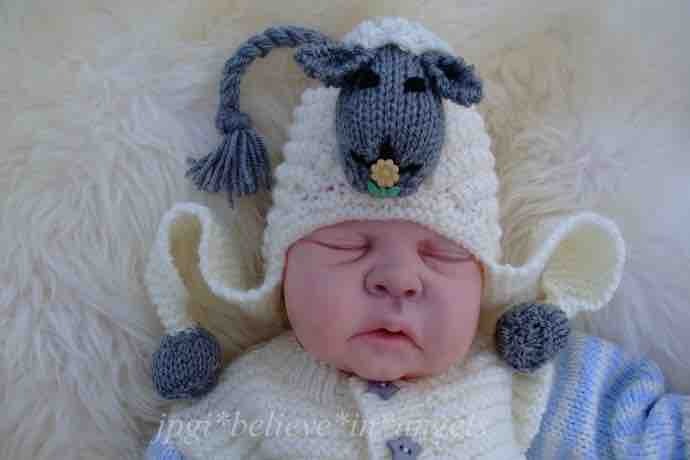 HOWEVER IT CAN ALSO BE MADE SMALLER TO FIT A SMALL NEWBORN, BY KNITTING IN 4 PLY OR BIGGER TO FIT 3/6 MONTHS. USING ARAN WEIGHT NO ADJUSTMENTS TO THE PATTERN WILL BE NEEDED ALL DETAILS GIVEN. LOVELY TO KNIT, ALL ON STRAIGHT NEEDLES.